I don’t know what it is about Asian beauty products, but holy cow, seriously, what’s up with the names? They’re so ridiculously long! I say this because I’ve found my holy grail of cleansers, and the name is a dozy. Are you ready? It’s the Innisfree Jeju Bija Anti-Trouble Cleansing Gel. Yeah, I’m going to call it the Bija gel from here on out, because I doubt I could say the full name correctly while sober. Seriously, how do you say jeju bija? I’ve been using it for about 2-3 months now, and I love it. Initially, I was worried, because it reports in at a pH of 3, which some people have said was too harsh for their skin. I definitely wanted a low pH cleanser because it helps maintain the skin’s natural pH around pH 5.5. Also, having that low pH tends to help with chemical exfoliation products like vitamin C serums and AHA exfoliants. I like to use both types of products, and it’s been keeping my skin flake free and clog free. Granted, the bija gel stings a bit if I use it after I’ve exfoliated too much, sort of like a milder version of alcohol on raw skin. That said, I haven’t had much of a need to exfoliate while using this cleanser, because it’s so good about cleaning my skin of everything – dirt, dead skin, exfoliation. I don’t even use my konjac sponge anymore because of this cleanser. Just splash water on my face, two pumps, massage on my face, rinse off, and I’m done. Bear in mind, it’s the middle of winter where I am in the US. The temperatures are swinging like crazy between freezing and something resembling warmth. 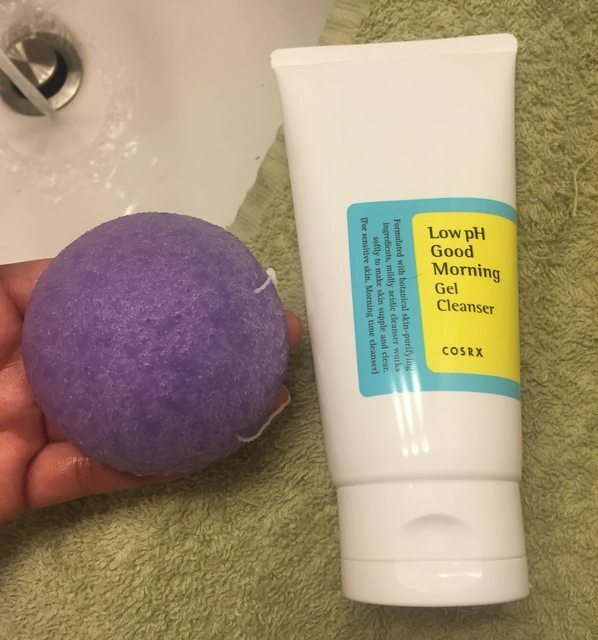 Yesterday, there was snow on the ground, and today it’s a high of 51 degrees F. It’s conditions that would drive my dry skin mad, but this gel cleanser has performed so well without stripping my skin of moisture. I love the fact that it’s a cleansing gel – no foam, less mess. My skin definitely does not feel dried out after using this cleanser, a fact I attribute to the gel nature of this cleanser. Some people have noticed a difference using cleaning gels, and I have to agree. Foaming products seem to strip my skin of moisture, leaving my skin feeling tight after I dry off. Not so with the bija gel, my skin feels clean, it washes off my oil cleanser (Banila Co. Clean It Radiance), and leaves no residues. I’d be hard pressed to find a better cleanser. Because I am who I am, I looked at the ingredients on CosDNA before buying it to see if it had any known triggers for me. Luckily, while the manufacturer has changed the packaging, they haven’t used any ingredients that can break me out. CosDNA does note that Tocopherol can cause acne and irrtation, rating it a 2 out of 5. I do like the fact that it has salycilic acid, something that I like to use to treat pimpes. I also like the rose extract – I’ve found that my skin loves roses, so that was a bonus for me. Also, my skin doesn’t seem to hate tocopherol, or vitamin E, so the addition of it as an ingredient didn’t worry me. Seriously, about the only down side I’ve found to this gel is that the scent bears an uncanny resemblance to Pinesol. Thankfully, the scent rinses off, but it definitely is an experience to use. I’ve already bought the back up bottle to the one pictured above and feel pretty much 0 need to switch cleansers ever. It’s readily available at sellers like Amazon, Memebox, Innisfree’s website, and many others. The only reason this bottle of isn’t empty yet is because I was testing out a new gel cleanser from CosRX. I wanted to love this cleanser, I really did. But… I didn’t. I used it for 3 weeks straight, and I have not loved it. There’s been a lot of hype and buzz about this product, not to mention it’s at a really great price point at $10 on Memebox. Yeah, I also noticed the ridiculously long name CosRX Low pH Good Morning Gel Cleanser. It clocks in at a pHof 5.5, which is really ideal for the skin. That said, the lower pH of the Innisfree Bija Cleansing Gel is better for products that contain Vitamin C, because the lower pH is closer to the range that certain forms of Vitamin C are active. Go read Snow White and the Asian Pear’s blog post if you want to get educated about pH and chemical exfoliants. But, sadly, CosRX’s cleansing gel did not love my skin. The scent reacted strangely with my skin and reminded me of old beef jerky. 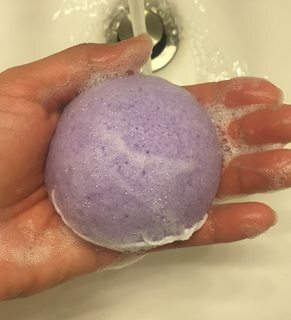 Even my SO commented on the scent, which lingered after I’d dried my skin and applied my usual routine of evening products. Yeah, I’ll take wash-away Pinesol scent over beef jerky. Also, it foams. Like mad. After using the Innisfree bija gel cleanser, the CosRX good morning gel cleanser did not strike me as a gel cleanser. For the sake of science, I applied both cleansers to my konjac sponge to see how much of a foam I could work up. Here’s what the CosRX Low pH Good Morning gel looks like after a quarter sized amount has been applied to my sponge and squeezed 5 to 6 times. See the shiny goop on my thumb? That’s more product waiting to form a foamy mess. 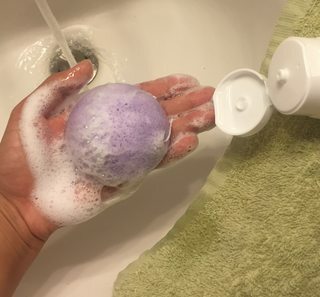 Here’s what the Innisfree Jeju Bija Anti-Trouble Cleansing Gel looks like after the same amount (2 pumps) has been applied to the same sponged and squeezed 10 to 12 times. I did this twice, just to make sure I hadn’t hallucinated the foam. Yeah. I didn’t even know I could get a foam out of the bija cleansing gel, but apparently if I work really hard at it, I can. Thanks to the foamy nature of the CosRX Low pH Good Morning Cleansing Gel, I noticed that my skin felt more tight and dry after washing. I didn’t care for it. I’ve since cheerfully switched back over to Innisfree’s impossibly long named cleansing gel. To be fair, I did take a look at the ingredients of the CosRX Low pH Good Morning Cleansing Gel on CosDNA. I’d say they’re even on the ridiculously long name front, though. But I’ll be sticking with Innisfree’s gel cleanser all the same.